Just call Pluto a comeback kid. After astronomers demoted the tiny, cold sphere from planetary status in 2006, it became the punchline of many a joke. But, as NASA's New Horizons mission nears Pluto, the icy galactic body is proving its importance once more. Although the probe won't reach Pluto until mid-July, team members already began reconsidering the dwarf planet's status. According to Michael Summers, a member of the New Horizons science team, it's even bigger than Earth – if we're including Pluto's atmosphere. Summers reports Earth's atmosphere is a layer with a thickness equivalent to a mere 10 percent of Earth's total 3,958-mile radius and it tapers out at about 373 miles above the planet's surface. Compare that to Pluto, whose outer atmosphere may stretch up to seven times its own radius of 746 miles. Although it's difficult to tell where the dwarf planet's atmosphere actually ends, Summers reports scientists relied upon a method similar to that used for Earth's numbers to estimate the circumference of the gaseous sphere. 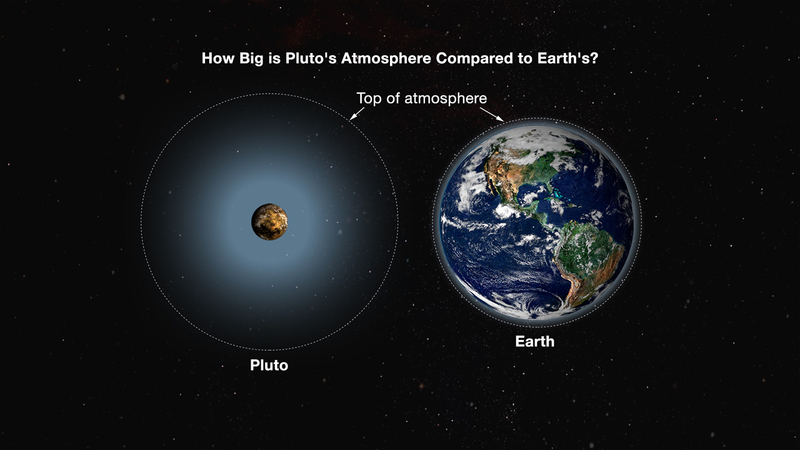 Pluto's atmosphere, it seems, is at least an awe-inspiring 350 times larger than the volume of the entire planet. That makes it even larger than our own beloved planet, atmosphere included. Take that, all you Pluto nonbelievers. Pluto proves it's still a force to be reckoned with, especially for the New Horizons team.